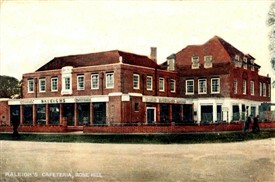 The Rose was a large public house built in 1933 and situated on the Rose Hill roundabout. It had a colourful reputation and was finally knocked down in 1987. The Co-operative supermarket now stands in its place. 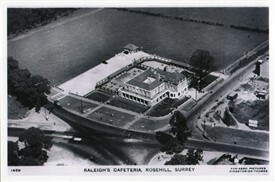 It was origionally named 'The Rose and Crown' but later shortened to 'The Rose' to avoid confusion with a public house of the same name in Wallington. It was hoped that the situation of the pub would mean it not only would serve locals living on the new council housing estate but would attract people travelling to and from London. 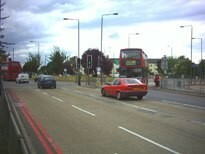 I think it is fair to say that the area had begun to look neglected in recent years. Public houses are certainly centres of the community and when they close it can be difficult to define an area and create places where people can congregate and socialise. Recently local shopkeepers at Rosehill and local councillors have formed a new traders association in an attempt to revive the shopping community. Measures to improve the look of the shopping centre have already started with new trees, paving and refurbishment of the roadside barriers. New seating areas and signs are also planned. A new car park and incentives to revive the sadly missed street market are also ideas being muted by the new body. Unfortunately, the pub is just out of shot in this photogragh. 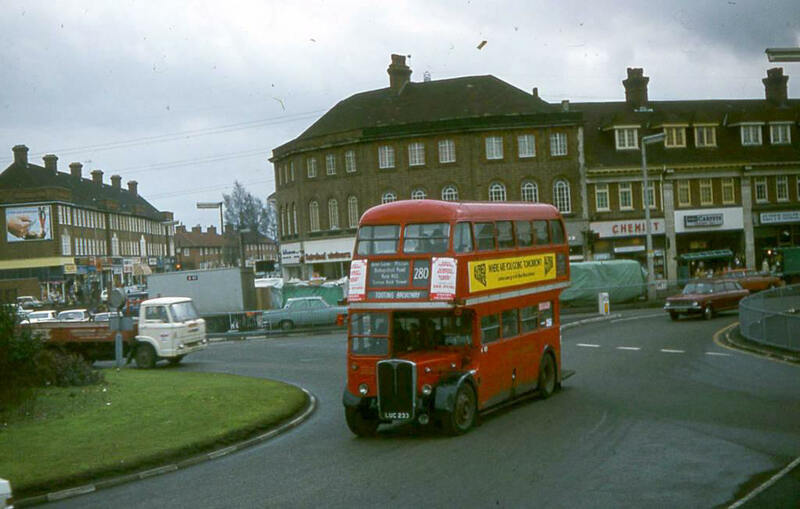 However, it is possible to imagine that situated as it was right on the roundabout it as highly visible to people travelling to and from London and as a popular stopping off point for day trippers and commuters alike. This page was added by Carol Smiles on 20/07/2010. I know that The Rose was not what you would call a comfortable pub, but it was a hub of the local community, as well as being a convenient place to meet your mates and perhaps move on to somewhere else. It was also a popular venue for the Mums and Dads, at the weekend, like the St.Helier Arms you had live music. Remember The Shadows with Johnny Lee? As teenagers we all thought it was a bit naff but they still pulled the customers in. Good page, well formatted and interesting to look back on and refresh memories of long ago. Thankyou. Many years ago as a little girl, I stood in the foyer of the Rose pub at Rose Hill peeping through the crack in the door waiting for my Mum and Dad to finish their drink and come home. It always seemed like hours to me but with a drink of lemonade in one hand and a pkt of Smith's crisps in the other, I would squat myself down in a corner and wait. I made a promise to myself that no kid of mine would do this and, I might add, they never did. Things were so different then, with men coming home on leave from God knows where with horror tales to tell so we kids just had to wait I suppose, and there was always the chocolate that Dad bought home, such a treat, so it was "chin up Rosie Fairweather it aint all bad gal". THE ROSE.How many council pubs h Saturday night it could take an age to get served,but for a small tip Earnie, one of the waiters would get served straight away.Well worth it . Saturdays would see a crowd outside the Rose waiting for the classified results newspapers. We were always sent there to get a paper, sometimes it was a long wait but the van from London would pull up by the telephone box. On the Eve of another Derby Day at Epsom I am reminded that on Derby Day a stream of traffic would pass The Rose on the way to Epsom. The Rose was a popular place to pull in especially after The Derby. We would stand over by the flats and shout to the open top buses etc "throw out your mouldies!" The passengers if they had had a good day would throw out handfuls of money, usually pennies, which we scrambled for. If they pulled into the car park they would line us up then throw the money! You can imagine the scene. Doesn't happen any more, these days the youngsters walk by any copper coins that have been dropped on the ground! The Rose conjures up many memories, during the 40's would walk up to the Rose with my Dad on a Saturday night to the off licence for a couple of brown ales & a stout for mum, not forgetting the empties, and buy a classified just to confirm that we had not won a fortune.. Happy Days. I used to work at the St Heliers Arms in 1976, in the off-licence with a woman called June. Had many a good night at the Rose in the disco on Fridays and in the pub with the Aussie pianist. I used to have the odd drink with a lad called Dave Appleby, wonder what happened to him, a geordie from Tyneside. I remember clearly the Sundays when I stayed at a friends house in Green Lane. Their mum used to put the roast in the oven and off we would all go to the Rose for a lemonade and a packet of crisps for us and a drink for their mum and dad. I just loved going there and feeling part of a family as I never had that with my own. Yes Terry Lake in the 50's I too used to go to the Rose on Sunday morning and wait outside for my granddad to bring me crisps out it was well worth it and the dog got a big biscuit from the jar on the counter. I remember your granddad, he used to give racing tips to customers, and by the way Terry my aunt Carol was married to the other Terry Lake (the boxer) who lived a few doors from the old pub. Nice to have spoken to you by way of this site. Hi Pat Collings, do you know if the other Terry Lake (the boxer) is still alive? My Dad was in the army with him and I've been trying to track him down for years to hear some stories.